Where can go when you want a wide variety of menu choices, hearty food, generous portions and reasonable prices? The answer is simple, head over to O’Murphy’s Restaurant and Pub on West Lake Drive near the dock area. It’s less than five minutes from the heart of town. 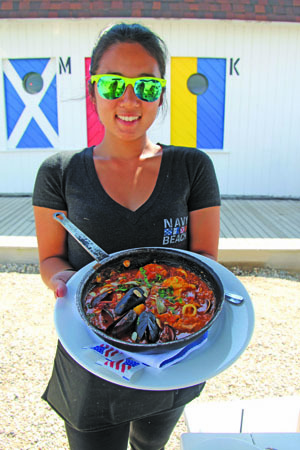 A Montauk staple for over thirty years the restaurant’s owners, husband and wife team, Jan and Chet, are two of the hardest working couples in the restaurant business and oversee all aspects of the restaurant. They say they are lucky to have long time professional staff that are dedicated to making guests feel at home when they come to O’Murphy’s. “Come in as a stranger, leave as a friend” is their motto. One aspect of O’Murphy’s menu is that families with children appreciate there is a full page for “Kid’s Menu” selections. All items are moderately priced and affordable for families to take advantage of while on vacation in Montauk and have children along. The regular O’Murphy’s menu is extensive and new entrees and additions are continuously added to regular favorites. Coming up with the menu selections is a fine team with lead Chef Francisco running the kitchen and assisted by Daviel, Ernesto, Geovanny, Jose, Javier and Luis. Come hungry to enjoy generous portions, reasonably priced and delicious meals! It is a winning menu and every member in your party will find several favorites prompting revisits to try! As repeat visitors, we always try something new and our server, Mark, helped by enthusiastically describing them. Starting with the appetizer menu, guests find the mussels in wine or marinara to be popular choices, as well as the calamari, Montauk Beach Salad or scores of other choices. The night our appetizer was the fresh mozzarella, tomato and basil dressed in olive oil surrounded by green and black olives. 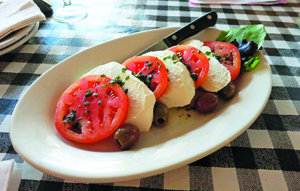 Thick slices of mozzarella and tomato were a perfect starter that was large enough to share. That evening my husband was in the mood for lobster, which when in Montauk is practically obligatory. 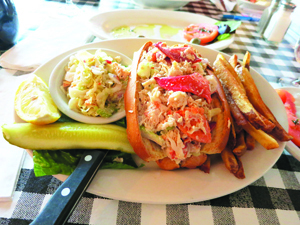 The lobster roll sandwich was enormous overstuffed with chunks of delicious lobster pieces and on the side homemade coleslaw and French fries complemented his meal. My selection was more difficult to decide between the special of cornflake crusted striped bass filet with roasted corn and pineapple relish served with mashed potatoes or the sautéed shrimp scampi. The scampi won, but next visit, I see a stripe bass platter before me. My plate of pasta and shrimp was huge and every bit a delight! 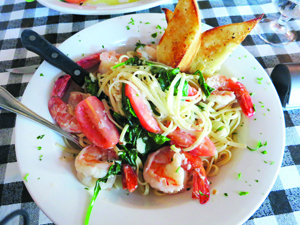 The jumbo shrimp throughout the pasta dish was enhanced by pieces of fresh sliced tomatoes and spinach leaves, adding to its colorful appearance. Dinner entrees range from pasta, poultry, meat or seafood picks. The roast duck, 24 oz Porterhouse steak, Hungarian beef goulash, grilled New York strip sirloin steak or barbequed baby back ribs offer a wide choice for the meat lover in your group. Montauk being a seaside village what better place than to try O’Murphy’s Spicy tuna, pan seared over a field of greens, with walnuts and apple slices and an Asian sesame ginger dressing? Last visit I had the salmon with mango salsa, rice pilaf and a vegetable and it was mouth watering good! O’Murphy’s is open for lunch at noon every day except Tuesday, when they open at 5 pm to start serving dinner. With over 35 lunch items, which also can be ordered at dinner time, the selections range from sandwiches to a host of delectable specialties. Famous for their 9 oz O’Murphy’s burger with a list of topping options, the burger can be beef, turkey or veggie. Steak sandwiches, grilled chicken, quesadillas and salads top the list of favorites, too. Of course, with an Irish name like O’Murphy’s, you’d be correct in expecting to find Shepherd’s Pie and Irish Lamb Stew among their trademark dishes. Since they are open year round, there is nothing like stopping in for one of these satisfying Irish dishes once again on a blustery, winter’s evening, as local residents and guests will attest to. Martini lovers will be delighted at the choices for the amazing flavors and other bar specials that makes O’Murphy’s the perfect place to stop in with friends after a busy day. How about ordering a “Montauk Sunrise, “Montauk Bay Breeze”, “Nuts & Berries Martini” or a “Very Berry Martini” to get your taste buds smiling? Speaking of martinis, the list starts with apple, pear, chocolate, passion fruit and the French Martini to try. Beer drinkers will find something to “wet their whistle” with the vast selection of both American and imported beers. Wine is available by the glass or bottle. Old world cooking, as mom or grandma used to make, is available at O’Murphy’s! The knockout dessert selections are not to be missed and when I dine out, dessert is ALWAYS a must! This visit I went back to their Signature house dessert, Bailey’s Heathbar ice cream, where the slice was large enough to comfortably share. Next visit it will be the Pina Colada Cake which we saw delivered to the next table. It is three layers of Pina colada-glazed coconut cake with pineapple compote and creamy coconut custard, covered with toasted shards of coconut, a tropical dream! Then again there is the Chocolate Peanut Butter Thunder dessert that might win out. While you are looking for a great meal ender, peek at their coffee list. They have an amazing selection including Irish or Dutch coffee and a number of exotic, international concoctions to delight your taste buds. Musical Entertainment: Every Friday evening from 7 – 10 pm Ralphie headlines the night with his guitar and vocals. Saturday and Sundays from 7 to 11 pm Michael Dann, vocalist and acoustic guitarist performs for guests. 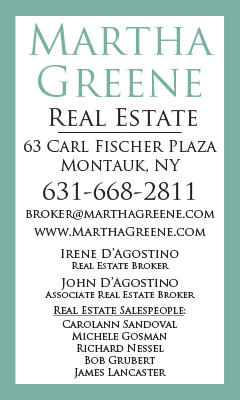 Call O’Murphy’s or check their website for entertainment updates or read their ads each month in The Montauk Sun. The late night scene is a great place for friends to meet or make new friends enjoying a night of terrific food and entertainment. 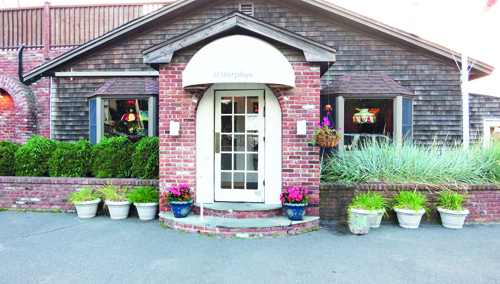 Information: O’Murphy’s Pub is open year round, every day for lunch, starting at noon and for dinner. On Tuesdays they open later at 5 pm to serve dinner. Catering -They also are available to cater all sorts of parties such as rehearsal dinners, showers, organizational functions, boat parties and Christmas parties, etc. The restaurant is large in size with indoor and patio dining to accommodate large parties and functions onsite, too. Their two dining areas can accommodate parties of 36 in one area and 60 in the other. Take out is available. Group parties or functions can be arranged. Credit cards are accepted. No reservations are necessary. 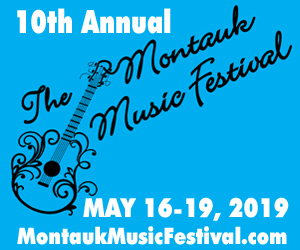 O’Murphy’s Pub is located at 432 West Lake Drive, Montauk, NY 11954 631 668-5005. Visit their newly designed website at: omurphysrestaurant.com. Enjoy a wonderful meal in a cozy, friendly, casual atmosphere, serving true Irish country dishes and more. Come in for the best mussels, best burgers, best seafood and best steaks. You, too, will come in as a stranger and leave as a friend.